New York Times Public Editor Clark Hoyt today writes about three episodes in which the newspaper's ethics guidelines were not followed by freelancers. In only one case did the violation lead to a tainted product on the page, so I'm dismayed that Hoyt played the issue so prominently--he could've put most of the column on the web. Meanwhile, he remains obdurately unaware of the Times's inability to cover the Atlantic Yards project, or to even disclose its business relationship with Atlantic Yards developer Forest City Ratner. In other words, he should focus on how readers are being served. 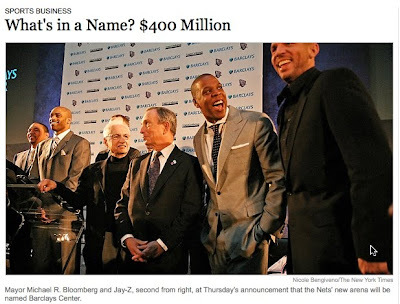 In two recent cases--FCR's bailout of ACORN and the revision of the Barclays Center naming rights deal--the Times slipped in information either parenthetically or at the end of the article, thus downplaying significant news. Transgressions are heavily chewed over on the Web, doing no good for the reputation of a paper trying to protect its integrity from even the appearance of improper influence. In April, I explained in an open letter why the Times should report how Forest City Ratner bailed out the embattled activist group ACORN with $1.5 million in loans and grants. Only in October was the information reported, parenthetically, deep in the article. It was worth more prominence, in a separate story. The Times played the naming rights story big when it looked good for Forest City Ratner, then minimized it when it didn't. Meanwhile, the newspaper continued to provide puffy coverage solicited by the Nets' p.r. department. Setting a record price for the naming rights to an American indoor sports arena, the British bank Barclays has agreed to pay nearly $400 million over 20 years to put its name on the Nets' planned future home in Brooklyn. And a sports business article (above) also focused on the price tag. That same sports business reporter, Richard Sandomir, on 11/12/09, wrote a lengthy article, headlined A Net Reaches Out to Fans, Wherever They Are, about how Nets guard Devin Harris makes a lot of fan appearances. The setting for the article was a Pathmark in Newark, but the Times didn't report that, as a Nets press release stated, Harris spent all of an hour there. Harris would be active under any circumstance, but he and his teammates must simultaneously maintain the franchise’s New Jersey fan base while building one in Brooklyn, where the team hopes to move in a few years to an arena that is part of the long-delayed Atlantic Yards project. But he didn't disclose, as he had in the earlier article, that "Forest City is also The New York Times's development partner on the newspaper's new headquarters in Midtown." Why is that important? Because it might make readers mindful of the Times's coverage of Forest City Ratner and the Nets' planned move to Brooklyn. Perhaps some coverage of Harris was in order. But was it worth 721 words? No, especially when the news of the revised Barclays Center deal--cut in half, nearly--was tacked onto the end of a 12/16/09 article about the arena bond sale--another article that lacked disclosure of ties to Ratner.